Before the invasion of Paneer (cottage cheese) in Sindhi kitchens, Bhee or Lotus stem or kamalkakdi enjoyed the Numero Uno position,where festive food was concerned. Bhee and Dingri (mushrooms) were supposed to be the food for family functions, marriage ceremonies, festivals etc, when nonveg was restricted . Here is an information about Lotus stem that I collected from few wonderful sites . The rhizome itself can be eaten raw, or cooked with other vegetables. Its chambers can be stuffed; it can be battered for frying, whole or in slices, finely shredded and squeezed, its juice can be made into a rich, creamy tea that acts to relieve congestion of the sinuses, lungs and intestines. The rhizomes are also dried and ground into a powder to create a somewhat less effective (and much less tasty) tea that is available in most Asian markets.It could be pickled,chips could be sundried and later fried ,it could be baked etc etc. 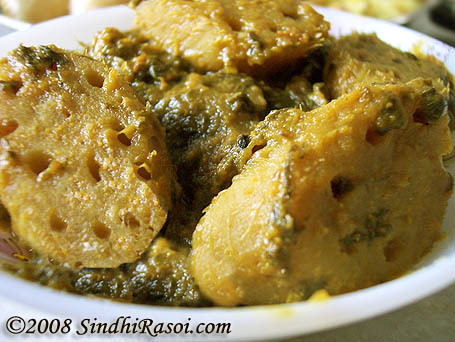 So here is yet another Sindhi style lotus stem curry made in Spinach gravy, known as Bhee paalak . 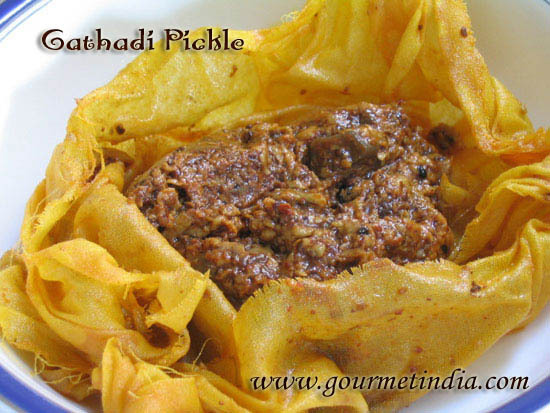 Traditional Lotus stem in spinach gravy recipe. Very tasty dish. The only condition is that lotus root should be soft, fresh and does not contain mud in the holes? Wash lotus root in lots of water before cooking. As a variation, make spinach puree and add after lotus root is cooked. The green spinach will look more attractive and dish will turn out more tasty. For those who do not like lotus root ? Boil half lotus pieces with beetroot pieces and then cook. You will have pale yellowish brown and red lotus roots in bright green spinach paste. 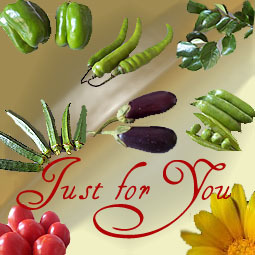 If “eye” likes, your tongue too will follow suit and you will love this “costly” root. It has lots of iron, Vitamin B & C and has lots of medicinal value. Believe me and make it your lovable root? Thanks for visiting my site :). Definately try it & im sure it will go very well with your Bhee Palak! I hv been a silent visitor to your website. that looks lovely .. its a totally new dish me for though ..
my husband and mom are going to love this but not me I have still not developed the taste for bhee. Wow awesome recipe with lotus stem..i tried twice the lotus stem as kormas..but urs looks superb n tempting me to prepare soon..delicious!!!! When i was in Delhi , my friends used to bring. I have never tried. Now i think i should try. Yummy curry. Info on lotus stem is good. All i make of lotus stem is sun dried fritters. And here I find many interesting recipes. Lovely curry Alka. It a looooooooooooooooooooooooooooooooooong time we did not have this lotus stems. I remember in childhood my mom used to make something with lotus stems. will ask her. I bookmarked this page :). It must be tasty. 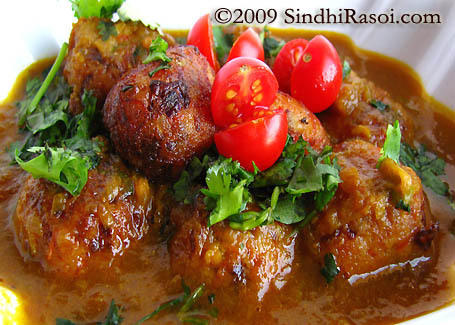 This curry looks yumm. I have never cooked with lotus stem. Alka, the curry looks delicious. I have tasted lotus root only once and don’t remember the texture or taste. I have a packet sitting in my freezer but have been postponing cooking thinking the texture is going to be that of celery. How is the texture of lotus root when cooked?